Okay, I freely admit this is a bit of a cheat. 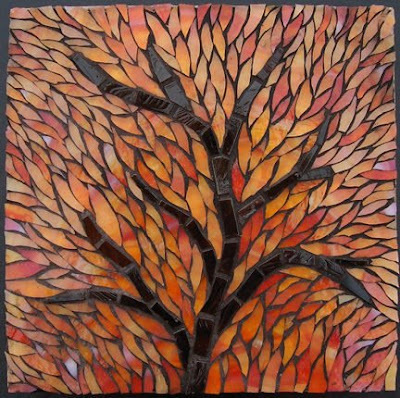 This piece was not created today, actually couldn't have been created in one day, as it is grouted. I did modify this piece recently by darkening the grout, as it had been much too light. However, I was just exhausted today, having just packed all the tile I am sending to San Diego for the Vendor Market at the SAMA conference, and I really liked the idea I had for the next mosaic, and wanted make sure that I did it justice. This just means that there is a really cool mosaic coming tomorrow.